Culiacanae, Americae Regionis Discriptio / Hispaniolae, Cubae, Aliarumque Insularum Circumiacientium, Delineatio - ORTELIUS,A. Title : Culiacanae, Americae Regionis Discriptio / Hispaniolae, Cubae, Aliarumque Insularum Circumiacientium, Delineatio. Size : 13.8 x 19.7 inches. / 35.0 x 50.0 cm. Description :Two great early maps of important regions in the New World. The first covers the region of western Mexico around Culiacan and the Spanish settlement of Villa S. Michael's, the region noted for its silver mines. 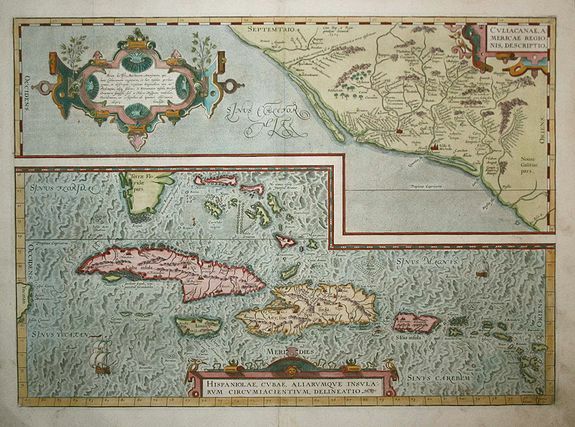 The second is the first detailed map of the Greater Antilles with detail in southern Florida and the Caribbean that is quite remarkable for the period. The map includes an interesting error in that the Tropic of Capricorn is shown where the Tropic of Cancer should be. Ortelius based the maps on a variety of sources including Mercator's world map (1569) and other maps by Gutters and Alone De Santa Cruz. Three strapwork cartouches and sailing ships decorate the map. German text on verso.